Each Gate has 6 Lines (16.67% each) Each Line has 6 Colors, each Color has 6 tones, each Tones has 5 Bases (20%). An activation is a point in time, measured by Gate, Line, Color, Tone, Base. These percentages show that, but are not important to remember themselves. 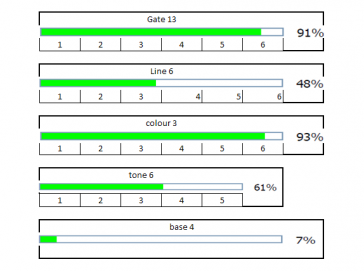 This picture shows it is at 7% of Base 4, which is identical to 61% of Tone 6, 61% of Tone 6 is identical to 93% of Color 3, 93% of Color 3 is identical to 48% of Line 6, 48% of Line 6 is identical to 91% of a Gate.